We are pretty sure Angela was a cat in a past life! She understands their ways of communicating like nobody else! And she articulates and translates their body language for us to gain great insight and understanding into cat ways. Angela loves Tabbies. 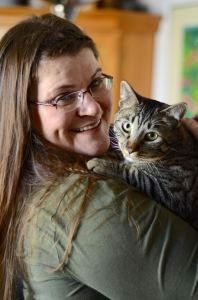 As long as we’ve known her, she has had tabbies….all rescues from the Idaho Humane Society. Angela is a foster failure, adopting those she intended to foster until a forever person came along. Angela pet sits part time and for fun. She is a professional technical writer in her real job. She writes incredibly creative texts to the clients. If you are lucky enough to get Angela as your sitter, you’ll love these fun updates. Besides her interest in cats, Angela loves dance, art, reading, music and gardening.